Many surface-mount electronic component packages work great with circuit boards made on the Bantam Tools Desktop PCB Milling Machine. Because of their small dimensions, small cutting tools are often required to cut the small traces. 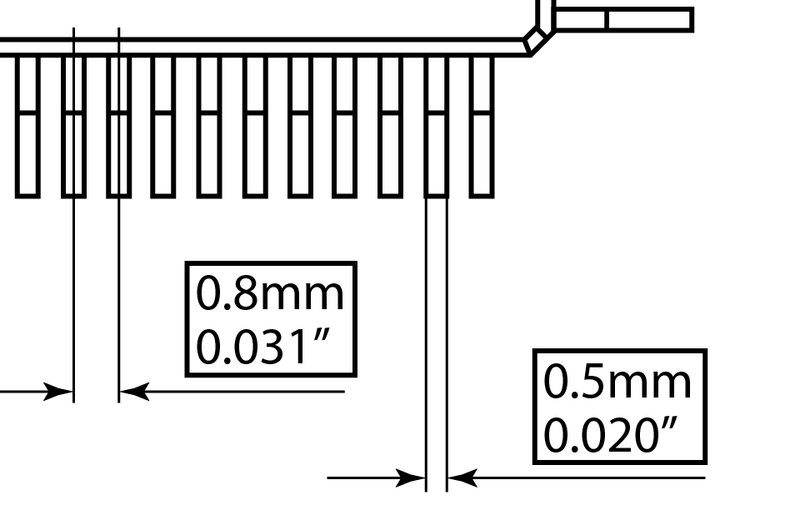 The lists below show the maximum tool diameter suggested to cut traces for SMD packages. For example, packages in the 1/32" list will also work with a 1/64" or a 1/100" tool. Packages in the "not compatible" list require traces too small to cut with the milling machine. Packages with the same name can vary slightly in terms of their pad size in design software, so to determine if your particular feature can be milled, we recommend loading your design into our software, selecting the end mills you want to use, and then looking at the software to see if there any red warning signs. If there are no warning signs, then the end mills selected are small enough to mill the package. If there are red warnings signs, try selecting a smaller tool and seeing if the red warning signs go away. If you've selected a 0.003” PCB engraving bit (30°), the smallest tool we carry, and you still see red warnings lines, then this indicates that the package cannot be milled. Here are general recommendations. More information on these packages and their dimensions is available on Wikipedia. Note that while the physical pins in these packages are spaced far enough apart to allow for the listed end mills, some digital versions of these packages have pads that are wider than the pins. Make sure to check the footprint in your PCB design software and reduce the pad widths if necessary. You can calculate whether you have enough room by subtracting the pad width from trace spacing (the distance between the centers of two neighboring traces). In the example below of a TQFP package, the trace spacing is 0.031" and the pad width is 0.020", which leaves 0.011". That’s enough room for a 1/100" end mill, which is 0.010".